Jessie Kanozak has found a way to prevent tons of material from ending up in landfills while helping to stabilize the Island’s marine environment by reintroducing organic material that has been removed by fisherman. Ms. Kanozak runs a program called the Shellfish Recovery Partnership, which was launched last May by the Martha’s Vineyard Shellfish Group (MVSG). Ms. Kanozak, a Maine native who graduated from the University of Rhode Island in 2006 with a Bachelor of Science in Aquaculture and Fishery Technology, travels around the Island in her pickup truck every other day throughout the summer collecting discarded oyster, clam, scallop, and mussel shells from local restaurants. The shells are stored until they are deemed contaminant-free, and then returned to areas depleted of shells by fishing. Not only is waste reduced, but shellfish beds are rebuilt with the material that young oysters depend on. And that material is free, sparing the Shellfish Group and town shellfish departments the need to purchase and transport shells, sometimes from off Island. A few years back the Island’s oyster population was severely depleted by a disease called Dermo, which spread up from the South. The MVSG launched an intensive restoration program that included increasing the amount of reintroduced shell to both Edgartown and Tisbury Great Ponds. The shell matter — up to 100 cubic yards a year — is currently purchased from off Island and shipped here around this time of year when the oysters are spawning. Today, according to Mr. Karney, the Island oyster population is at a healthy level. Ms. Kanozak started interning with the MVSG while she was still in college. 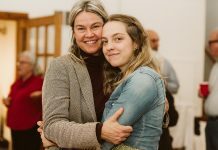 After earning her degree she moved to the Vineyard full time and took a job at Offshore Ale Company, where she is currently employed as the Restaurant and Retail Operations Manager. Through her restaurant experience she became aware of the volume of shells that were being wasted. She also knew that the local ponds were being replenished with purchased shells and that shell recycling programs had been successful in other areas. Through a grant from the Edey Foundation, Ms. Kanozak launched the recovery partnership in May 2011. She and one volunteer, Molly Bangs, a hatchery intern, collected three tons of shells from restaurants and events last summer. For the same reason, Ms. Kanozak discourages people from dumping shells into the ocean on their own. “Unless you know the water body they came from you should not to put shells back in the water,” she warned. “You run the risk of introducing organic matter to a different body of water.” Ms. Kanozak plans to make it practical for householders and fisherman to contribute to the cause by setting up drop-off sites at various places around the Island. “By the end of 2012, there will be a safe place to drop off shells,” she said. 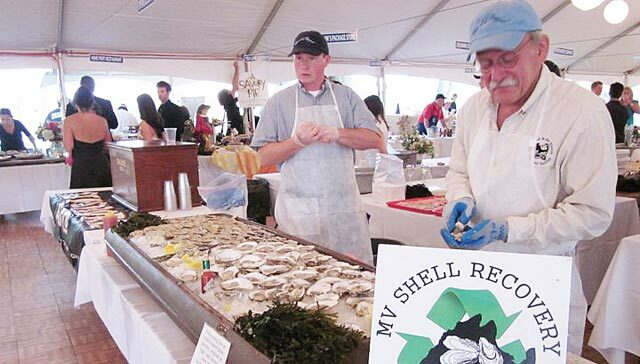 Although oysters are the primary beneficiaries of the program, other shells go into the recycling mix. “Mussel and scallop shells are brittle. By the time we move the material around in the shell pile, they’re broken down but it’s still a natural resource that we should be putting back into the ocean. Reintroducing shell bits gives the bottom structure and aids the overall health of the pond. Mr. Karney, who is Ms. Kanozak’s Vineyard Visions mentor, said, “Shellfish spawn millions and millions of animals and only a few reach maturity. We used to think that was due mainly to predation but there’s been a lot of scientific research done lately showing that acidic waters may be responsible for these losses. Anaerobic bottoms of ponds get really acidic causing shells in the early stages to dissolve. We lose a lot of shellfish that way. Ms. Kanozak is looking for volunteers. She needs people who can lift up to 25 pounds and have their own truck to collect shells one day a week in the summer. Interested parties should contact her at jkan8356@yahoo.com.